Foothills Ranch - Pool can be heated solar or gas.Must see!!!!!!! ! MLS#2053840. Paradigm Realty. Sun City Macdonald Ranch - Elegant yet comfortable home features an elevated privacy lot with covered patio. MLS#2052642. BHHS Nevada Properties. Macdonald Highlands - Real Estate Sales Office Open 10-5 Tues-Sunday MLS#2050174. Synergy Sothebys Int'l Realty. 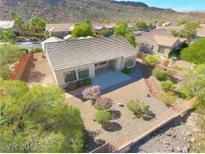 Sun City Macdonald Ranch - Jr Master Suite w/CF & Door to Courtyard, Bath w/Dual Sinks & Shower. Plantation Shutters, Covered Patio, & more! MLS#2044301. Realty Executives Southern. Sunridge Summit Manor - The property is currently occupied by a tenant with monthly rent of $1700.00 MLS#2044748. Zenith Realty Group. Sun City Macdonald Ranch - Fully Fenced yard, Cv Patio, Security Door at Entry, Wood Laminate/Tile/Carpet Flooring throughout, Kitchen has Granite countertops/Upgraded Backsplash/Newer Good Quality Stainless Steel Appliances, Ceiling Fans, R/O system, Water Softner, Garage has Epoxy and Garage Tiles/Overhead Storage/Sink, Plantation Shutters. A Must See!! ! MLS#2044442. CR Realty Services LLC. Macdonald Highlands - Dual 2-car garages wired for electric cars MLS#2042717. Rob Jensen Company. Foothills At Macdonald Ranch - Relax in one of 2 elegant master suites or perhaps at one of the many intimate outdoor patio settings with breathtaking views. MLS#2042153. Wardley Real Estate. Sunridge Summit Heights - Wonderful landscaping front and back with specimen palm trees and great curb appeal. Stainless appliances in kitchen stay. MLS#2040219. BHHS Nevada Properties. Macdonald Highlands - Championship Golf Course;Fitness Center, Tennis & Swim Complex, Clubhouse Bar & Dining. MLS#2040930. Synergy Sothebys Int'l Realty. 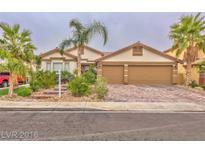 Sun City Macdonald Ranch - Covered back patio and golf cart parking. MLS#2034000. Windermere Prestige Properties. Sunridge Summit Heights - Covered patio with ceiling fan. Welcome Home! ! MLS#2033889. Black & Cherry Real Estate. Foothills Macdonald Ranch - 5 car garage & so much more! MLS#2032315. Platinum R.E. Professionals. Canyons Macdonald Ranch - $300K UnderValued!Immaculate, Move-In Ready!Enjoy Panoramic views of spectacular sunsets,LV Strip lights & adjacent mountains from every room inside & outside making Indoor/Outdoor Living at its Finest.Gated features Huge great room,family room,designer kitchen,dining room,An entertainer's dream,THEATER ROOM; Elevator Option;every bedroom & room has access to the pool/spa! MLS#2032502. Compass Realty & Management, L.
Macdonald Highlands - At 12,978 SqFt this masterpiece boasts an 8 Car Gallery Style Garage w/fully integrated Tesla Power System and Tesla Car, Flex plan offers up-to 6 Bedrooms, Office, Wellness Spa, Theater, Private Hideaway Master Retreat with Spa- Inspired Bath, Couture style Closets, Culinary Master Style Kitchen, Automation,Resort Pool/Spa MLS#2021802. Growth Luxury Realty. Sunridge Summit Manor - fireplace in Living room , huge laundry rm upstairs, large master bedroom with sitting area, walk in closet, custom window casing thru out. MLS#2018971. Golden River Realty. Macdonald Highlands - Rear yard w/lagoon pool, spa, & outdoor kitchen. MLS#2011166. Rob Jensen Company. Macdonald Highlands - Fully separate guest house, vast great room with double height ceilings, movie theater, wine cellar, salon, home automation. amazing MLS#1998960. Simply Vegas. Macdonald Highlands - Resort Backyard,Fire Bowls, Pool House.Country Club MLS#1996400. Synergy Sothebys Int'l Realty. Macdonald Highlands - Golf, Fitness, Tennis, Swim, Bar,Dining&Clubhouse. Completion Date Q2 2019. MLS#1994242. Synergy Sothebys Int'l Realty. Macdonald Highlands - Completion Date Q1 2019. Country Club Lifestyle MLS#1991813. Synergy Sothebys Int'l Realty. Foothills At Macdonald Ranch - Country Club Life Golf Course; Fitness, Tennis & Swim Complex, Clubhouse Bar & Dining. MLS#1983136. Synergy Sothebys Int'l Realty. Foothills At Macdonald Ranch - Country Club Life Golf Course; Fitness, Tennis & Swim Complex, Clubhouse Bar & Dining. MLS#1979158. Synergy Sothebys Int'l Realty. Macdonald Highlands - Opportunity to Select Finishes & Personalize.Completion Q3 2018. MLS#1912789. Synergy Sothebys Int'l Realty.